Series (F) includes a range of home designs which are suitable for land which has a gentle fall from front to back, below street level. The Series (D) configuration is a smart concept which adapts the conventional double storey home design to flow with the contours of your sloping home site. 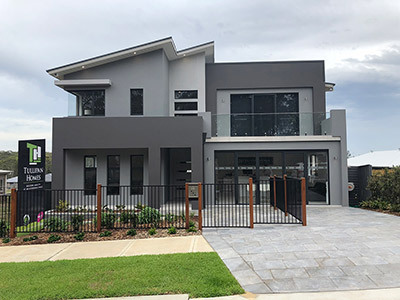 The Tullipan Home Designs within this category are: The Sorrento MK V, The Sorrento MK V Metro, The Sorrento Metro 32 Squares, The Sorrento MK V-Skillion Roof, The Santa Monica,The Bayview Split Level Metro Skillion Roof, The Laguna. 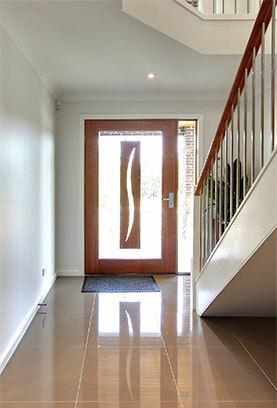 Home designs in this category take full advantages of slab on ground (split slab) construction. The concrete floor slab to the ground floor level is formed and poured as two individual slabs, with an internal deepened concrete edge beam of 1.2m in height running left to right, dividing the ground floor into two distinct areas; one consisting of standard 8ft (2.4m) ceilings, the other with the stepped down area on the low side consisting of 12ft (3.6m) ceilings. Optional hi-lite windows can be added above the doors and windows to the lower sections, further complimenting the benefits of the 12ft ceiling areas. This floor plan layout can also be known as a Tri-level home design. The attractions to this design type are the feeling of Grandeur that is achieved with the introduction of 12ft ceilings. The grand entry foyer being located on the higher level opens up to a bright and spacious main living area to the rear. The effect of the 12ft ceilings to the main living areas needs to be experienced to be fully appreciated. This design feature is a concept rarely undertaken by project home builders and has grown in popularity to become one of Tullipan Homes most successful design concepts. 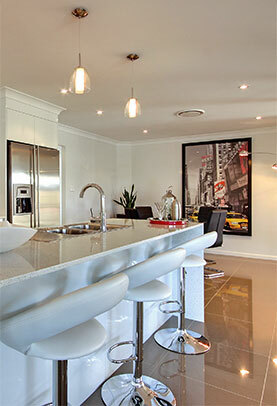 The concept of 12ft ceilings with increased hi-lite windows can be experienced first hand at our Wadalba Display Home. Series (F) home designs can also be combined with the use of deepened edge beams across the rear to tackle steeper land grades. This introduction would be subject to local Council policy in relation to maximum heights of buildings etc.